We make this evergreen quinoa salad all year long. It’s so simple and quick (it comes together in just 40 minutes) that it’s ideal for a vegetarian lunch or dinner when you're tight for time. The chopped almonds add fantastic crunch and a nice hit of protein, so you'll feel full and satisfied. 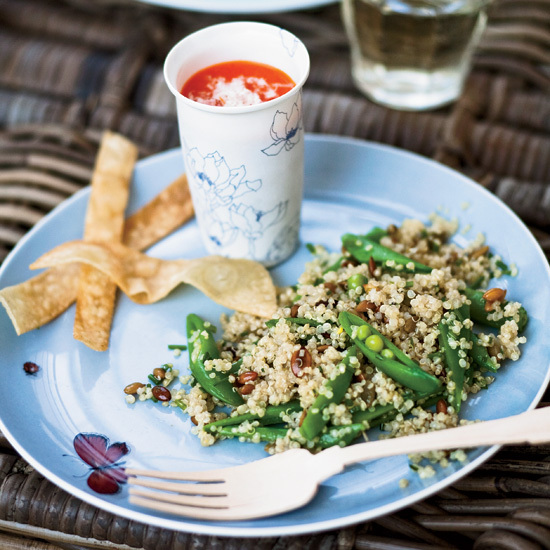 Hearty, super-healthy quinoa is spectacularly versatile. Here are 20 of F&W's best recipes for salads that use the nutty-tasting grain, from ideal vegetarian main courses to light and flavorful picnic sides. Quinoa (pronounced KEEN-wah)—a tiny little seed with an ancient history—packs a big nutritional punch: It’s high in protein and nutrients with anti-inflammatory properties, which is likely why it sustained people in South America’s Andes mountains (where quinoa grows best) for so long. 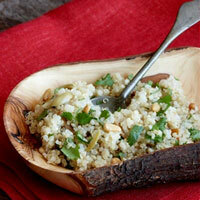 Quinoa has a mild, slightly vegetal flavor and cooks up fluffy, like couscous, but is still slightly crunchy. Quinoa can have a bitter residue on it, so make sure to rinse it well in a fine mesh strainer. Like pasta, you can boil quinoa in a lot of water, then drain it. (You know it’s done when the little tails are visible.) Or, combine 1 cup quinoa with 2 cups water and bring to a boil, then simmer, covered, over low heat until tender, about 15 to 20 minutes. For extra-fluffy quinoa, return it to the saucepan after cooking. Cover the pot with a paper towel and then close the pot with the lid. The paper towel will absorb any excess water. 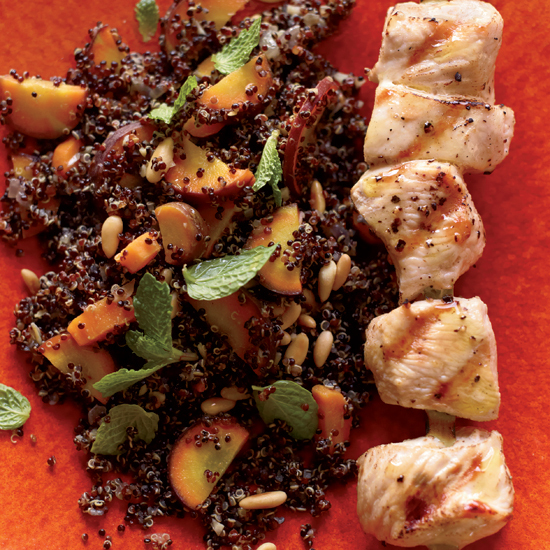 Eating quinoa is a great way for vegetarians to get protein. 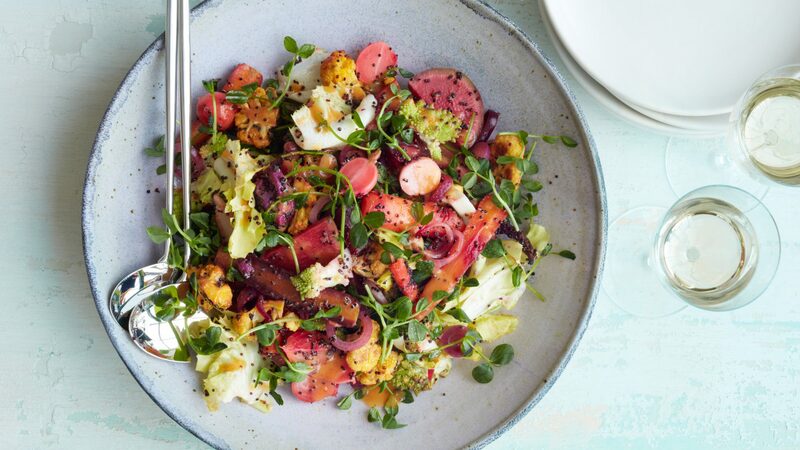 Chef Jeremy Fox tosses it with crunchy shaved vegetables for a refreshing salad loaded with vitamins and minerals. Snap peas and sunflower seeds add texture and crunch to this picnic-perfect salad. Giuseppe Tentori’s recipe features a tasty mix of crunchy cucumber, parsley and feta. Red wine vinegar-pickled radishes add a pungent kick. “While in Los Angeles filming the second season of Top Chef Just Desserts last year, I discovered Café Gratitude, a vegan café with a cult following,” Gail Simmons says. 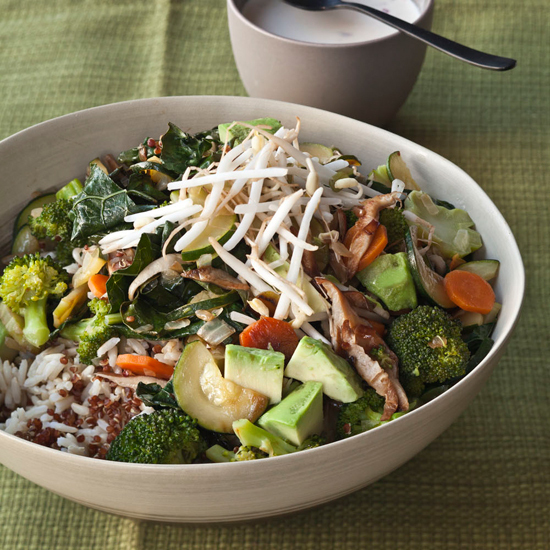 “For me, its fresh, simple food was the perfect antidote to all that sugar.” When she returned to New York, she developed her own version of the café’s signature bowls of grains and vegetables. 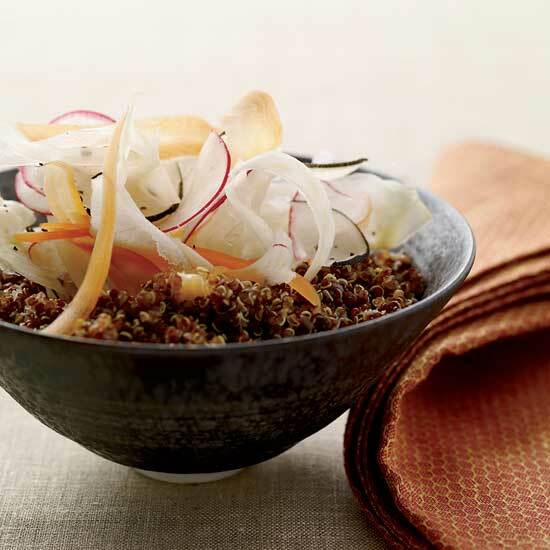 This salad from F&W’s Grace Parisi brilliantly combines some of the most exciting current food trends into one amazing recipe—pickled vegetables, uncommon produce, ancient grains and a cross-cultural dressing that includes miso and chipotle chile in adobo. “One thing I’ve learned as a chef is not to overfeed your customers—a food coma is very unpleasant,” says Charlie Parker of Plum restaurant in Oakland, California. 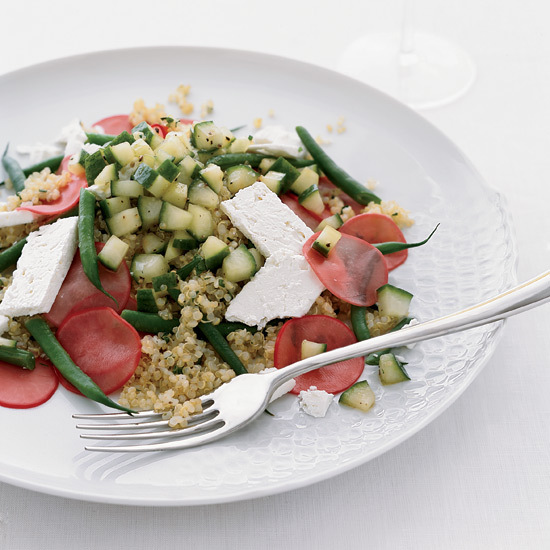 This salad of grilled vegetables feels just filling enough, thanks to the protein-rich quinoa. 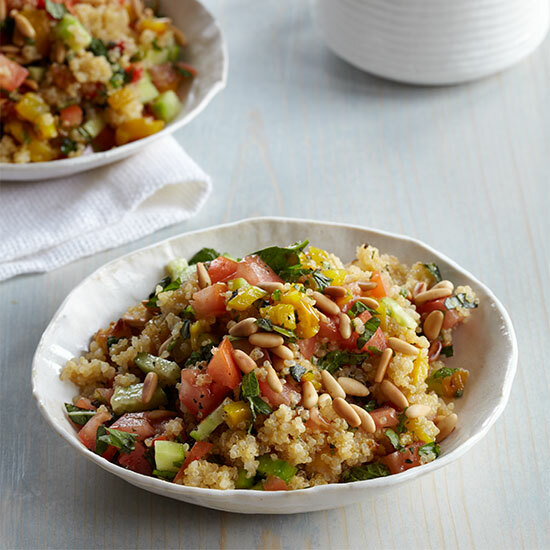 Crunchy pine nuts, fragrant cilantro and flavorful green olives are a delicious combination in this simple and healthy quinoa salad. 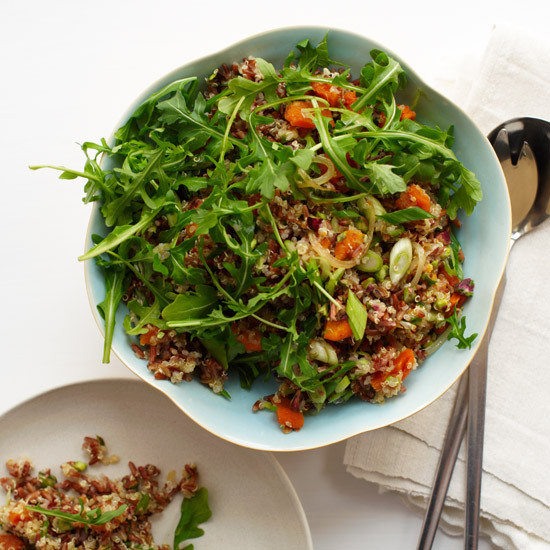 Tangy dried apricots, crunchy pistachios and fragrant scallions add depth to Yotam Ottolenghi’s sensational red rice and quinoa salad. Topped with arugula and a zesty orange dressing, it makes a terrific accompaniment to roast fish or chicken. This delicious and super-healthy salad is a wonderful meal-in-one. “I grew up with a bunch of hippies, so I ate a lot of quinoa,” Kerry Simon says. “I thought the taste was so cool.” For this tabbouleh-like salad with tomatoes and roasted bell peppers, Simon simmers quinoa in water and orange juice to give it a citrus hit. 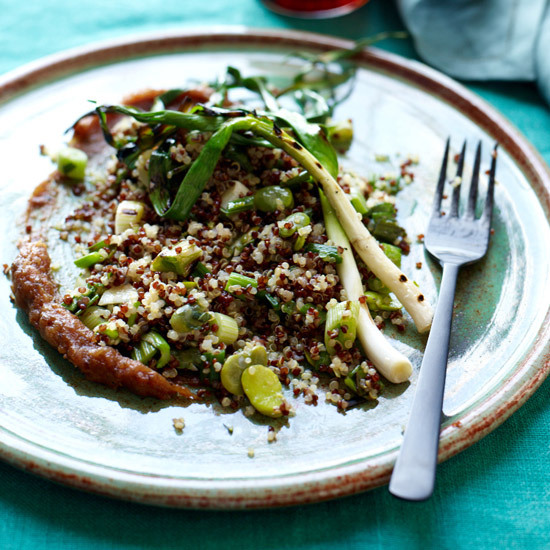 Cumin, coriander and cardamom punch up roasted carrots in this tasty red quinoa dish. It’s equally good served as a main or side dish. 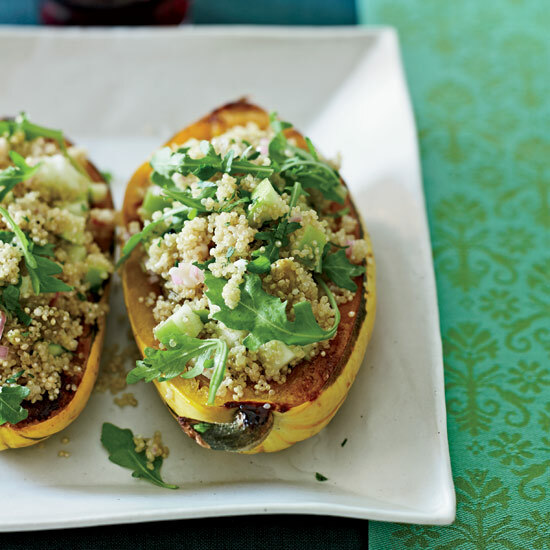 To create a delicious and filling vegetarian main course, Michael Symon of Cleveland's Lola tosses quinoa with arugula, apple, raisins and fresh herbs, then spoons the salad into a halved baked squash. 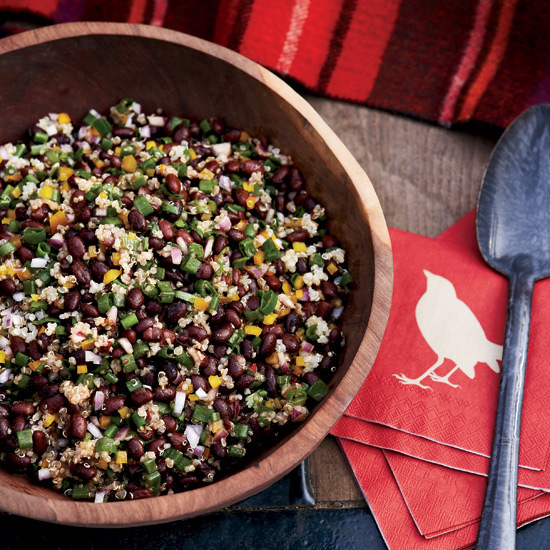 Ken Oringer mixes quinoa with black beans, onions and peppers to make a hearty and satisfying side dish that's a fun variation on prosaic five-bean salad. Jarred cocktail onions add flavor (and decrease prep time) in this fabulous Tex-Mex inspired recipe. Quick and nutritious, Cat Cora’s warm salad with carrots makes a great side for grilled chicken or fish. This hearty dish of quinoa and wheat berries makes a terrifically healthy side, and it’s easy to make ahead of time. Emmanuel Piqueras adds crunchy artichokes and hearts of palm to quinoa, then tosses it with a tart dressing of white wine vinegar and avocado oil. 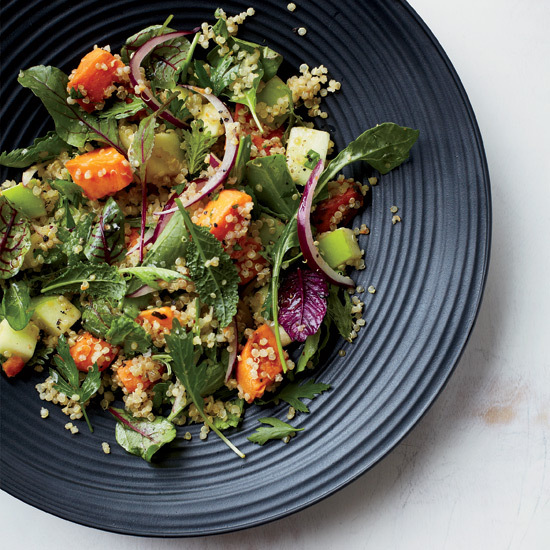 This fast and healthy quinoa salad is both sweet and savory, showcasing winter fruits like pear and kumquat alongside cucumber, watercress and cilantro. 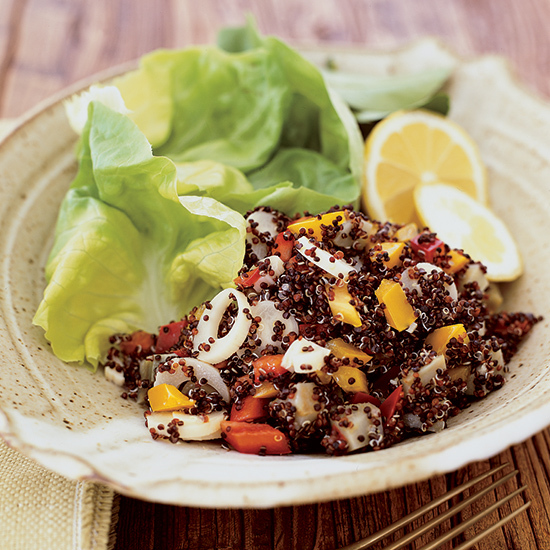 Bell peppers, Jalapeño and cucumber give this quinoa salad a flavor profile similar to pico de gallo salsa. 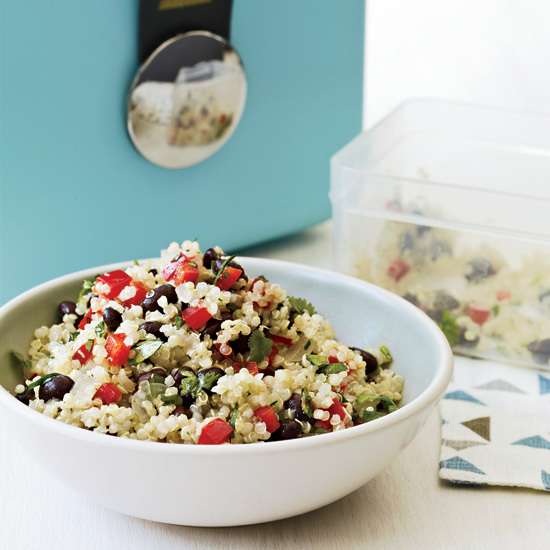 Served at room temperature, this easy grain salad is a great healthy addition to a buffet table.